The Erasmus PhD Association Rotterdam (EPAR) was founded in 1993 under the former name “InterFacultair AIO-Overleg Rotterdam” (IFAR). Since its foundation EPAR has been exerting itself to protect the interests of all PhD candidates at the Erasmus University (EUR). EPAR’s mission is to help create an Erasmus University that provides an even more attractive and inspiring working and research climate for its PhD candidates. EPAR represents all current, former and aspiring PhD candidates, as well as early career researchers of the Erasmus University and the Erasmus Medical Center and all others who feel part of the Rotterdam PhD community. We cooperate with the PhD councils from the departments to give PhD candidates and those who feel part of the Rotterdam PhD community a face and a voice at the university level. 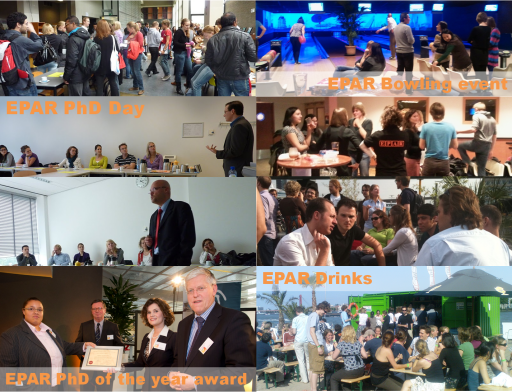 EPAR organizes drinks and other social events, provides information for PhD candidates, and maintains contacts with the policy makers of the university. EPAR also has a close cooperation with PhD Network the Netherlands (PNN) and is therefore always informed about political and other issues that may be relevant for PhDs. You might know EPAR from the PhD day/career event, a day for all PhDs that includes lectures and workshops about the various skills and qualities that are needed for the successful completion of your PhD trajectory and beyond. Or maybe you know us from our numerous other events throughout the year. We organise drinks and dinners where you can meet your fellow PhD students or the other academic staff, as well as specific courses or other activities useful for your PhD. EPAR consists of board members and faculty representatives (FRs) from the different faculties of the Erasmus University. The board members take care of all ongoing activities to further EPAR’s goals. They meet on a monthly basis, organise the various events, inform the community on various topics, serve as the contact for general issues that concern PhDs, and maintain contact with the different departments of the university and other organizations in the Netherlands through PNN. In order to reach everyone in the PhD community of Erasmus University, and to keep in touch with the faculty PhD councils, EPAR also has meetings with FRs. During these meetings, we discuss what is going on within different faculties, we exchange best practices about dealing with certain PhD-related issues, and discuss political/national issues that affect PhD candidates. Next to these meetings, we ask from our FRs to promote any important issues among their colleagues and to make sure everyone knows how to find EPAR. EPAR holds it in high regard to remain a completely independent organisation. Our activities are financed through sponsoring as well as variable yearly donations from either faculties, faculty PhD councils, the supervisory board of the EUR, and the Erasmus Trust Fund. If you are interested in participating in joining the EPAR board or becoming a Faculty Representative, please send us an email or speak to one of our board members. We always welcome people to help out and make EPAR of even greater service to the Rotterdam PhD community!